Bonolenov is member number 13. He dresses partially in rags and looks like a mummy. During the York Shin arc, his appearance was insignificant. During the Chimera Ant arc, he was seen fighting with the rest of the Genei Ryoudan against the Chimera ants. Very little is known about his personality and reasons for joining the Ryoudan, but in the fight with the Chimera ants he displays a mocking and confident attitude. Bonolenov originates from the Gyudondondo tribe, and is one of the Genei Ryoudan who did not originate from Ryuuseigai. When the boys from his tribe are 3 years old, needles are poked into their body. These needles are slowly replaced with bigger needles, and eventually sticks, until holes in the skin are created. The people of this tribe are called "dancing warriors," perhaps ascribing to the different sounds that are created depending on the holes. 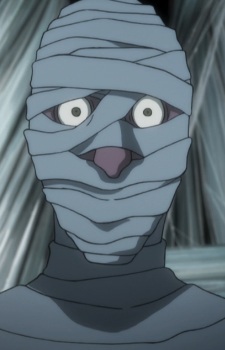 He dresses in bandages, which cover up a mass number of holes throughout his body. Battle Cantabile: he plays music through the holes on his skin during battle, with different songs creating different nen effects, such as transformation of his own body or the materialization of objects. Only two of his Battle Cantabile abilities have been revealed: The Prologue and Jupiter. The Prologue allows him to conjure warrior gear onto his body, along with a spear. Jupiter allows him to conjure a giant sphere (with the appearance of the planet of Jupiter) and crush his enemies.